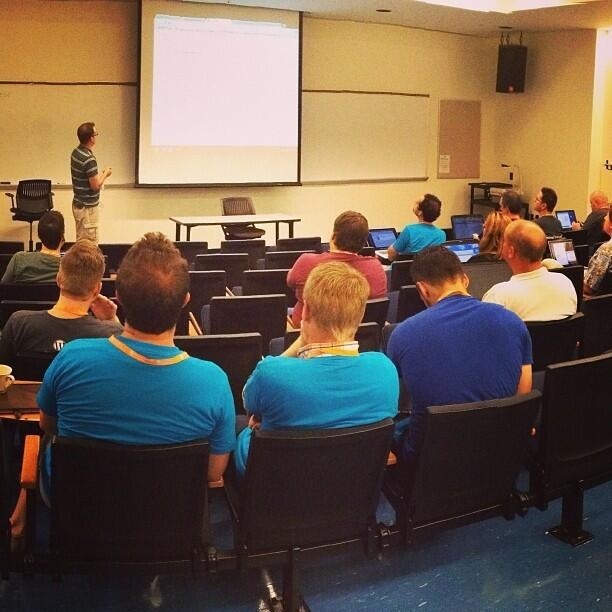 I recently presented at this year’s WordCamp Grand Rapids. I would like to take a minute to write about my experience. For starters, I was thrilled to be selected. I found out while spending a day in Peoria with the family while our new car got detailed. Little ‘ol me selected to present to other WordPress developers. Who would want to hear what I had to say about web development? So extremely humbled. It was a long trip from Pontiac, IL to Grand Rapids, MI. Made more difficult by construction. I left before sunrise so that wasn’t as big of a deal. It was bad timing because of other family events so I could not stay. Had to drive up, present, catch some other presenters, do a couple of tours of duty at the Happyness Bar and drive back. Made for a long day, but did not want to miss the opportunity. Wish I could have stayed for the after party and following days events. Next year. I had the first developer spot of the day. I was super nervous to talk in front of so many people and still struggling to get over the fact that I was selected. All these people here to se me? I noticed some people from Automattic in the front row which didn’t help calm my nerves either. I was speaking on making the admin more user friendly. Using Custom Post Types, custom database tables, and Meta Boxes to eliminate user confusing for novice authors. The presentation went by really quickly. I was given forty minutes, but finished somewhere around 20. I speak quickly when nervous apparently. The Q+A afterwards went well. Lots of good questions and discussion. Felt more at ease doing the Q+A. Had several attendees approach me afterwards for more questions or just to say they liked it. Afterwards I worked at the Happyness Bar. For those that don’t know, it’s just an area to go and ask presenters or other experts questions. Meet someone there who had my same model Chromebook and a similar problem I have been working on. It was awesome to connect with someone in real life that had worked on something I had been working on instead of a Gravatar on a forum. The highlight was probably Brad Parbs session on Sass. I’m a believe in Sass now and will be using it moving forward. Next year I’m hoping to attend Chicago and Grand Rapids again. Hopefully speaking at one or both of them. I would like to make it a family event and stay the weekend with the wife and kids. If you develop/design/author a WordPress site/blog I suggest going to a WordCamp. Very informative, fun, and you get to meet great people.